Mirror photo by Patrick Waksmunski Tessa Crider of Bishop Guilfoyle drives as Juniata Valley’s Taylor Leidy plays defense. 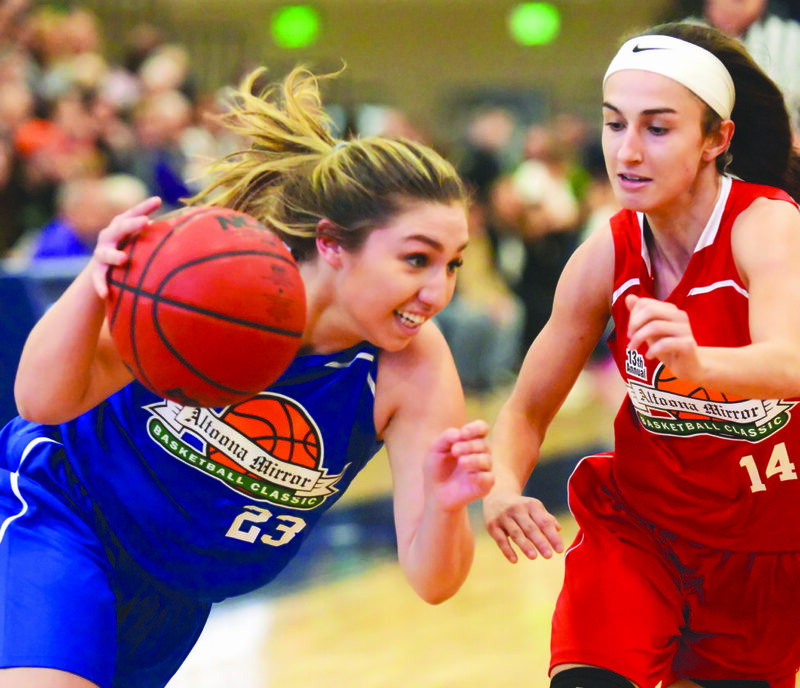 The final hurdle for the Blair County girls in their attempt to end a four-game losing streak in the Altoona Mirror Basketball Classic series was a connection between an Altoona player and a Hollidaysburg player. Even though it may have seemed a little unnatural to area fans used to picking one side or the other, Lady Lion Kayley Burke connected on a perfect full-court pass to Lady Tiger McKenna Hurd to seal Blair County’s 64-61 triumph over Central PA in the 13th annual game Saturday at Penn State Altoona’s Adler Arena. Hurd’s layup with 13 seconds to play marked the first Blair County points since Tyrone’s Emily Lehman made two free throws with 2:04 left that made it 62-54. Central PA upped its defensive pressure and used a 7-0 run to make it a one-point game with 17.9 seconds left. Lehman finished with a team-high 12 points, including a key jump shot with just over two minutes left that stopped a 6-0 Central PA run. For her efforts, the Tyrone senior was named Blair County’s outstanding player. Lehman will continue her basketball career in the same gym she played in Saturday when she joins the Penn State Altoona women next fall. “She does a good job,” Blair County coach Deanna Jubeck said. “She’s a tough matchup for anyone. She’s strong inside, and she made that 15-foot jump shot with a couple minutes to play that was big for her. Blairsville’s Rena Enterline led all scorers with 14 points and was named the Central PA outstanding player. Blair County led by two at the half and maintained a slim lead for most of the game until Burke’s layup early in the fourth quarter started a 9-0 run that put Blair County up by 10 with 5:10 to play. During the run, Bishop Guilfoyle Catholic’s Tessa Crider found fellow Lady Marauder Aliyah Labriola for a basket. 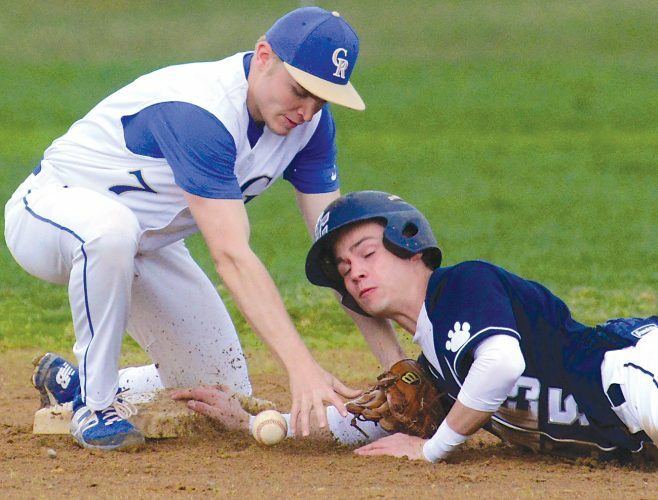 It was that type of teamwork and chemistry which seemed to give Blair County an advantage. Homer-Center’s Emily Worcester scored 12 points, and Bishop Carroll’s Alyssa Martinazzi added 10 for Central PA.
Martinazzi got a chance to play for the Juniata Valley girls coaching staff. Carroll and Valley have split the last two District 6 Class 1A titles. Central PA now leads the all-time series 8-5. CENTRAL PA (61): Worcester 6-7 0-0 12, Reffner 1-7 0-0 3, Fusaro 1-8 4-4 6, Reed 0-4 0-0 0, Enterline 6-11 2-2 14, Martinazzi 4-13 0-0 10, Friedline 0-3 0-0 0, Leidy 2-7 2-2 7, Swartz 1-4 0-0 3, Petrof 0-1 0-0 0, Newhouse 0-5 1-2 1, Strasser 2-4 0-0 5. Totals — 23-74 9-10 61. BLAIR COUNTY (64): Hurd 3-7 3-4 9, Lear 0-6 0-0 0, Mock 3-7 0-0 6, Labriola 2-6 0-0 4, Stevens 0-4 0-0 0, Bettwy 2-5 0-0 5, Gildea 1-2 2-2 4, Crider 2-2 0-0 5, Michelone 3-5 0-0 7, Hollen 1-3 2-2 4, Burke 3-8 0-0 8, Lehman 4-9 4-6 12. Totals — 24-64 11-14 64. 3-point goals: Central PA 6-26 (Martinazzi 2-8, Leidy 1-2, Strasser 1-3, Swartz 1-3, Reffner 1-3, Reed 0-2, Friedline 0-2, Fusaro 0-3); Blair County 5-16 (Burke 2-5, Michelone 1-1, Crider 1-1, Bettwy 1-2, Gildea 0-1, Hollen 0-1, Stevens 0-1, Lear 0-2, Mock 0-2). Rebounds: Central PA 22 (Fusaro 7); Blair County 30 (Hurd 5). Assists: Central PA 4; Blair County 7. Officials: Mike Andrews, Jeff Fisher, David Day.